Sourced from the finest sustainable tree plantations in Indonesia, our Jumbo Bin 120 Bottle Wine Rack is now more durable, more beautiful and more eco-friendly than ever before. Hand-cut and hand-sanded for a remarkably even color and grain. Square shape features diamond and triangular shaped compartments to group your wines for easy access. Stack on top or side-by-side. New and Improved--Stronger in Mahogany! Sourced from the finest sustainable tree plantations in Indonesia, our Jumbo Bin 120 Bottle Wine Rack is now more durable, more beautiful and more eco-friendly than ever before. Hand-cut and hand-sanded for a remarkably even color and grain. Square shape features diamond and triangular shaped compartments to group your wines for easy access. Stack on top (while supporting to the wall) or side-by-side. Recommended to brace to a wall for strength and stability. Jumbo in size and holds up to 120 bottles of your favorite wine. Easy assembly with pre-drilled holes. I want to stack two units. You indicate the top unit, I presume, needs to be secured to the wall. Please describe how that could be accomplished in a room with concrete walls? BEST ANSWER: The Jumbo Bin 120 Bottle Wine Rack (Mahogany) should definitely be secured to a wall when it's being stacked. There are concrete anchors that can be used to secure the rack to the wall and I suggest you go to your local hardware store to inquire which one will work best for your needs. I ordered the dark mahogany finish, to go with the woodwork in my house, I was horrified when the rack that showed up was effectively painted purple. I going to have to sand and refinish it. You couldn't even see the grain of the mahogany. I have a number of these ranged against three cellar walls, against which they are sturdy enough; they're not great as an unsupported standalone. The Mahogany finish is too purple, but I'm the only one that sees it. Certain bottles, actually only one very slope-shouldered style from a Lodi vintner, only works in the very bottom, or they will fall out, and one does best placing like bottles with like, in terms of size and shoulders. But fitting 120 or so bottles in a - 4 x 4 square at this price is, in my opinion, a bargain. I don't think you coukd duplicate it youself for anything like the low cost. The packaging is a total mess -- keep a vacuum and a trash bag handy but installation is easy. In a series of seven assemblies, I had one short interior piece, but it was replaced promptly. I had a horrible experience actually getting my shipment. I had to keep contacting customer service. My order shipped with three separate tracking #'s but I was only given 1. Of course the one tracking numbers order arrived and I had to keep asking about the other 2. One of which was damaged in shipment and returned to the factory, but, no one bothered to let ME know. Once I finally received all three pieces (about 6 weeks later) I put them together. They look nice, but in no way the quality I was expecting for the price. Save your $ and make your own or find another manufacturer. I have ordered 12 of these racks over the years. good quality for my wine shop. the last one I ordered was missing all the hardware, but a phone call remedied the problem. Works well together with two of them side by side. If you really want brown or mahogany you should probably get the natural wood and stain it yourself. Worry that the slats can easily slide out from the frame (there is nothing securing them and the fit is not really tight) but so far the wine bottles seem to be pretty secure once stacked. I use these in my crawl space, but they would be fine in public view. We use this to store and display bottles behind our bar. It fit right into a corner we didn't use well. It now holds 9 cases for us on display instead of ugly case boxes, and makes restocking very easy. Easy to set up. Looks great in any room. It is a great way start a wine collection. Most economical, and sturdy rack available. Solid against a wall, would definately need brackets for stacking. It was relatively easy to assemble, and it's attractive in living space. I have discovered, however, that Pinot and Syrah bottles don't stack very high. This also enabled me to discover the hydrogen peroxide and dish soap cure for wine stains on carpet. Overall, this has a very nice design and the wood had a very nice rich color. It was extremely simple to put together. The only negative was that it didn't feel as "sturdy" as I would have liked...when it was empty, a slight push felt like it could have collapsed the entire thing. HOwever, once the bottles were put in place, it doesn't move, so I guess it is OK. ANyway, for the price of this unit, it is a great value, as other wine racks were very expensive. This is a nice alternative to the traditional "box" type design, and does hold many bottles. For the price, this is a decent, sturdy rack. I store about 250 bottles in two of these and have a couple of smaller cubes stacked on top. They work well. Great wine storage. Especially good if you buy by the case, or are a home wine maker. Easy access to your collection. Relatively easy to assemble if you are somewhat handy with basic tools. Looks great in the wine room. best use in wine cellar, would rather see the color in walnut as it would go better with other items in wine cellar. Looks fantastic and holds a ton of wine! We bought this rack to fit in a very shallow space, and it worked out beautifully. It was easy to put together, and looks wonderful with the 2 mahogany wine racks on the wall that we already had from another retailer. We are now able to fit a lot of wine bottles into a small space with a great looking piece! 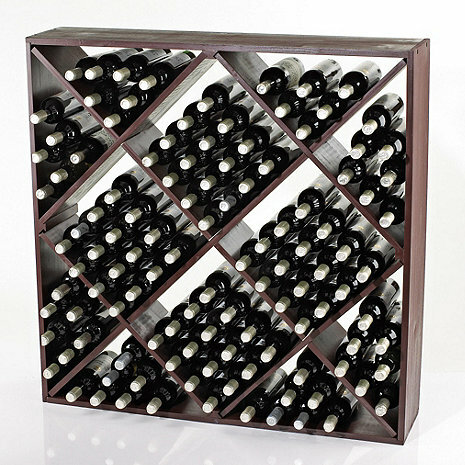 Purchased for large format bottles in my wine room and it is well suited to the purpose. Looks good as well. Wine Cellar in a Day! We have been searching for the past year for some nice sturdy wine racks for our growing wine collection (we make our own). We were thrilled to find these--love the x-box design, they are simple but classy, very sturdy. The price was great. We had read the review about the "purple color" but did not find it quite so "purply" and are very happy with the dark stain. Couldn't believe how quickly they arrived after we ordered them just paying regular shipping. Nice product. Looks nice and is sturdy. 120 bottle capacity. Nice finish. The only thing that I do not like is that the bolt holes are exposed. I am going to try to find a stain to match and fill the holes with wood putty. This did not hold as much as advertised and bottles do want to slip out. Also--open box OUTSIDE!!! I am still picking up styrafoam beads inside my house. My brother assembled it and he is a contractor. He said directions were not good. Delivery was prompt and the packaging was in good shape. Looks great and takes up so little space. I will probably buy another one. Great product, we are using them in our wine show room at the company. It gives a nice look to the room, and stacking them up, makes them to hold strongly. Great addition to my wine cellar. Efficient use of space for storage, but also looks nice and was easy to put together. My only negative is the cost was higher than I would expect for the simplicity of the product. Product was backordered and the condition of the product was less than expected. The product that was originally delivered was incorrect. We then had to wait to have that one picked up and the correct item shipped. You get what you pay for-maybe. Overall the product is ok for the price range. We had to reinforce all of the pieces as the assembly was either broken or flimsy to begin with. It is probably adequete for the basement storage we currently do, but would not buy this product again. We had higher expectations of this product as it was referred to us by a friend. We would have returned, but it seems to hold the wine (read other reviews about bottle slippage) and it would have been more hassle to return than our time to do so was worth.